The centre section (black PVC plastic in the picture). The comb houses 10 blow holes and chambers. 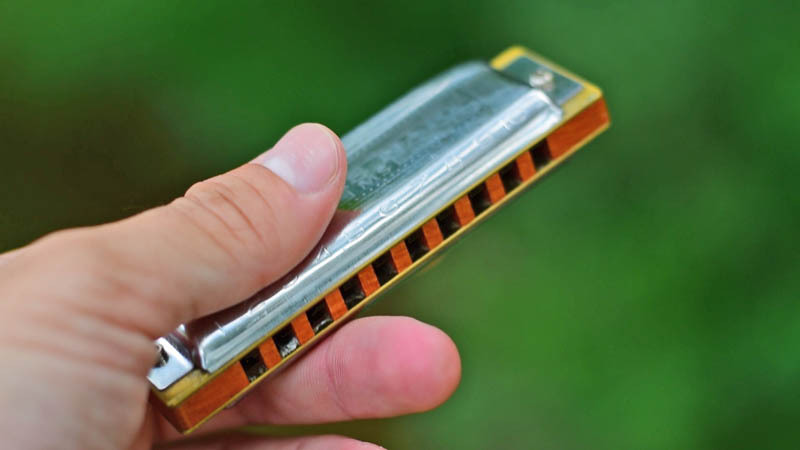 Originally it was crafted from pear or apple wood (it still is on models such as the Hohner Marine Band and Blues Harp). Wood expands and shrinks with moisture however. Longterm this can lead to loss of airtightness and warping. Plastic combs were introduced around the 1970’s for greater durability and economy of production. There are also light metal alloy combs (Suzuki and Hohner both have examples). Players may prefer different combs; generally a wooden comb gives warmer tone. The harmonica key is normally stencilled or embossed on the short end of the comb. Made from bell metal or brass alloy, each reed plate carries 10 reeds (see image above). The upper reed plate is for the blow notes; the lower reed plate is for the draw notes. Often you can see where machine tools have milled metal from the rivet end of a reed in order to fine tune the pitch (scratch marks and blemishes in the metal). Reed plates bolt to the comb with small screws. The longer the reed, the lower the pitch. These protect the reeds. Traditionally they are attached by two screwbolts and flat nuts (see image above). Nowadays there are also countersunk screws that do not require nuts. Either way, the screws are bolted through the comb, over the reed plates and tightened to keep the cover plates in place. Normally cover plates are nickel, tin, alluminium or a shiny metal alloy. The Hohner Pro Harp has a matt black coating which looks sharp, and there are plastic alternatives on cheaper models. The upper cover plate usually has numbers 1 to 10 visible along the leading edge. The brand and model type is also embossed on one or both cover plates (Lee Oskar in the image above). And that’s all there is to it! 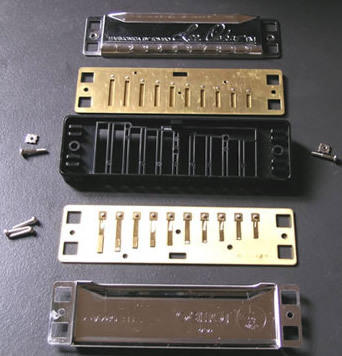 Here you have the basic ingredients for your ‘tin sandwich.’ Also commonly known as the Blues Harp (name derived from the ‘French Harp’ brand sold in America in early 1900’s), Gob Iron (British), Mississippi Saxophone (US), Lady Shaver (some old perv who should get out more) and Cookie Cutter (Lee Oskar). Lee Oskar pioneered a ‘modular’ system that has become standard for most brands. This means next time you ‘blow’ (or break) a reed, you can purchase and install replacement reed plates at half the cost of a new harp. So go out and invest in a jeweller’s screwdriver kit from your local hardware store and keep it with your harps in preparation. By the way, when Lee Oskars first appeared, Hohner adapted their basic spec to match. Essentially the blow holes changed from a narrow rectangular entrance to a uniform (and wider) square entrance. The net effect was that harps became slightly longer. Check out ‘Hand Made’ or original Hohner Marine Bands for the early spec we were once all playing! Try standing it end to end with a modern Hohner or Lee Oskar. Notice the difference? Incidentally, the newer Hohners have ‘MS’ printed on the cover plate to indicate they are Modular System. ‘Hand Made’ normally refers to non-Modular System models. It may also be possible to obtain replacement Hand Made reed plates, but you’ll need to know the difference when ordering. And now you do!